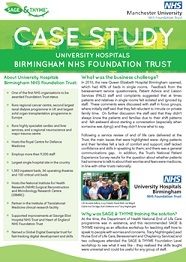 We're pleased to announce our second SAGE & THYME case study on how and why University Hospitals Birmingham NHS Foundation Trust adopted the SAGE & THYME foundation level workshop. It also covers the challenges the Trust was facing, the benefits of the training and some tips for those organisations considering running the training. Click here to go to the case studies page.